Starting to explore my family history has been extremely interesting. Using the new crime records, I discovered that in one branch of my family there were three brothers who had all followed a life of crime. However, given the frequency of police reports the brothers appear in, it's clear that they weren't very successful! The story of the three criminal Calfes, William, Albert and Arthur, began at home. Their father was absent, having been diagnosed as insane and committed to London Colony mental asylum. Their mother either didn't work or had very little to support them after their father became absent, so I'd like to think their criminality was due to circumstance rather than opportunity. The eldest, William Richard, born in 1870, was something of a real life Artful Dodger. He features in a crime report as the ringleader of a teenage gang of cockney pickpockets and housebreakers, and was arrested and jailed in 1886, the year after his father was committed. The amount stolen was not insignificant either, with the total valuation of goods taken coming in somewhere around £2½, equivalent to a theft of upwards of £130 in today's prices. William must have considered himself lucky to have escaped with a minor prison sentence, as the records don't seem to indicate evidence of further criminality. Instead, he married and started trading as a French polisher, and is listed here in the 1911 census as the head of a large household. His wife's family, however, were not so upstanding. His wife's grandfather and father are recorded as being imprisoned in 1861. 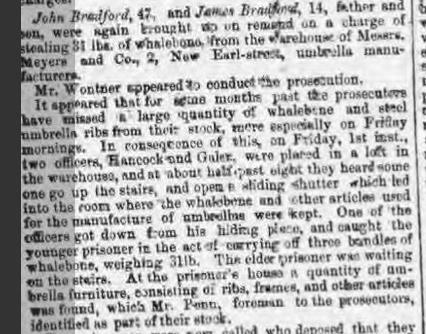 They had stolen 31lbs of whalebone from their employer, a theft so large that it made the local press. Whalebone, with a wide range of uses from fertiliser to corset strengthening, was a valuable commodity in Victorian England, so this was a significant theft. The middle brother is more interesting still, if slightly more tragic. Arthur Calfe (a little close to home for me as my paternal grandfather shared his name) was born in 1880. He was was arrested and charged with being an 'incorrigible rogue' in 1910, for 'deserting his children and causing them to become chargeable to the Parish of St Pancras' for the second time in two years. For this, Arthur served seven months with hard labour. But criminality seemed destined to run in the family. With an absent father, the two sons of this marriage, Arthur Reginald and Henry, were jailed for breaking and entering and common burglary. Now we come to the final brother. Albert Calfe appears to only commit one crime in his life, and it's a relatively minor one. He was convicted and bailed at the cost of £5 (or £240 today) for the theft of 7 shillings (about £16) and some sweets. Yes, you read that correctly. Sweets. The reason for this disproportionate sentence? Well, with brothers who were previous convicts, maybe the judge wished to steer young Albert away from a life of crime. Have you discovered any roguish relations yet? Explore our our crime, prison and punishment records to discover if your family was as criminal as the Calfes.